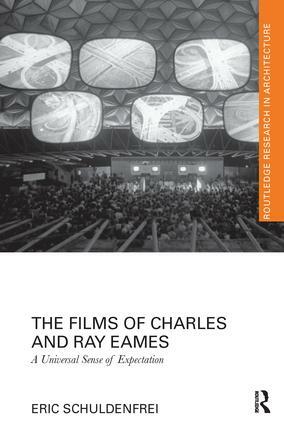 The Films of Charles and Ray Eames traces the history of the Eameses’ work, examining their evolution away from the design of mass-produced goods and toward projects created as educational experiences. Closely examining how the Eameses described their work reveals how the films and exhibitions they generated were completely at odds with the earlier objectives exemplified in their furniture designs. Shifting away from promoting the consumer-culture, they turned their attention to the presentation of complex sets of scientific, artistic, and philosophical ideas. During a critical period from the late 1950s to the early 1960s there was a moment of introspective self-reflection in the West stemming from the events of the Cold War. This moment of uncertainty was crucial, for it provided the incentive to question the values and concerns of society as a whole. In turn, designers began to question their own sense of purpose, temporarily expanding the purview of design to a broader field of inquiry. In the case of the Eameses, they identified an overriding problem related to consumerism and excess in America and sought to resolve the issue by creating a network of communication between universities, governments, institutions, and corporations. The solution of promoting greater education experiences as an alternative to consumerism in America required that different sectors of society functioned in unison to address political, social, economic, and educational concerns. The Films of Charles and Ray Eames reconsiders how design intersects with humanity, culture, and the sciences. Eric Schuldenfrei is a designer focused on the relationships between urbanism, architecture, and art. Together with Marisa Yiu he is a partner of ESKYIU, a studio that has been awarded the Architectural League Prize and featured in numerous biennales: "Urban Pastoral" at the Venice Biennale, "Human Motor" in Ljubljana, and "Mediated Labour" in Hong Kong. Past projects include an installation commissioned by Agnes Gund, President Emerita of MoMA. Currently an associate professor at the University of Hong Kong, Schuldenfrei received his PhD from the University of Cambridge and has taught at Princeton, Columbia, and the Architectural Association. Schuldenfrei served as the Curator of Exhibition, Education, Film, and Media for the 2009 Hong Kong & Shenzhen Biennale and has presented his work at the International Design Alliance congress, Harvard University AsiaGSD, Cambridge University, and the V&A Museum.